After being abandoned by the kids for the long weekend (one had a friend coming over, the other was going to a friend's), I packed up the might Subaru wagon and headed east, toward the heat, for a couple days in Cle Elum. I got to the cabin at about 2pm and the temperature was well into the 90s, without a breath of wind, which is unusual for this time of year, where it usually blows a gale from mid-June through August. The town was having its annual Pioneer Days Festival, which includes a 3 on 3 basketball tournament. It was so warm downtown, with the sun baking the brick buildings, that main street was virtually deserted, except for a few diehard spectators trying to stay cool in the shadows, watching the unfortunate players suffer on the asphalt courts. Next morning I got up reasonably early and felt like a climb, so I headed out past Lake Cle Elum, intent on climbing Mt Thorp, which at over 5800' would make a reasonable 3500' vertical gain hike from the trailhead. Quite surprisingly, there were no other cars at the parking area (which admittedly is not shown on most maps). I headed up the trail's first mile, which is quite steep, but passed through very lush brush and an overflowing spring creek. After passing through a lovely meadow, the trail headed steeply up again, mostly through smallish pine trees, which provided ample shade in the morning heat. 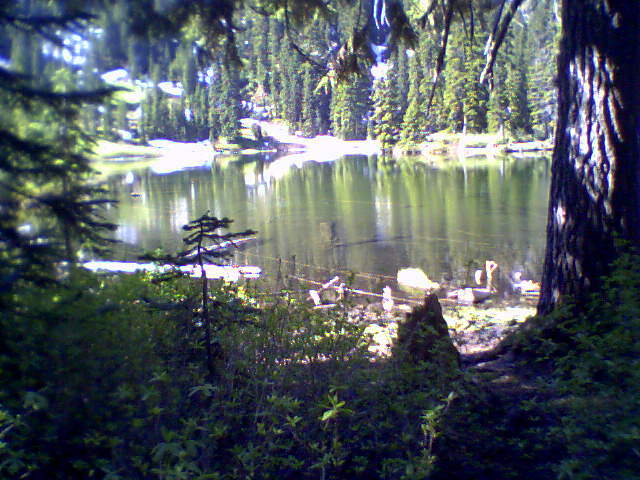 It was here in the shade that I ran into the first snow, which covered the trail for hundreds of yards at a time. It was fun to practice my old route-finding skills, especially since there hadn't been any recent hikers, so there were no footprints to go by. 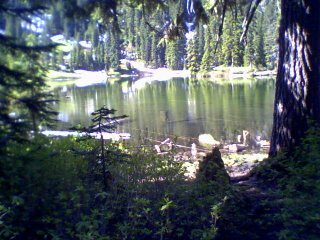 Shortly thereafter I passed by beautiful Thorp Lake (see picture) and was absolutely amazed that there was nobody here either. I had the whole lake to myself and kicked myself for not bringing my fly-rod. From there I had to go off-trail, climbing more or less straight up the side of Thorp Mountain, hoping to run into the Knox Creek trail, which would take me to the summit trail. After about 45 minutes I did hook up with the main trail and an hour later I was on top, where I saw two people sitting on a snow bank with their dog. I was pleased that there was cell phone reception as I was able to send some real-time photos to a few friends. It only took me 90 minutes to return to the car, and less than five hours after I left the cabin, I was back home again--beer in hand. I, too, often wake up early on a 90 degree day and think "what I need to do is go outside and move around a lot to see if I can actually get even warmer". And then I go back to sleep. Nice picture from the camera, though, do you have to send those to yourself as an e-mail to get them on your computer? I will get up early to watch all the STPers leave without you and Greg this year.